Jake is saddened at Dodger’s confession that he has never felt loved and not only that, he’s also missed the chance of knowing what it’s like to fall in love. Dodger was a very troubled young man when Jake helped him and took him on. It ended in tears, literally on Jake’s part, but the Archangel Azrael granted Dodger’s wish and brought him back to partner Jake in their emissarial work. The two have formed a close bond and work well together. Azrael seems to have mellowed slightly since we first met him, although he still has a pretty scary temper at times. He’s on a learning curve too, never having had such close communications with humans and so is unfamiliar with their emotional needs. He does his best to help when needed, even as it frustrates him on occasion. Some days, they worked together as a team, the way they’d started out in Atlanta. Other days, they split up, each looking for souls in trouble of one sort or another, then meeting again for lunch. Another week went by with Dodger staying too busy to worry about his lost love life. But when the boy’s spirits began to droop, Jake suggested they continue on to the Keys, and Dodger perked right up. Jake and Dodger find out just how hard a task master Azrael can be as they learn to harness and control their increasing power under the angel’s unrelenting tutoring. The characters continue to develop and the bond, which becomes more like a father/son relationship, between Jake and Dodger strengthens. Dodger is learning to manage his feelings of insecurity now he knows how much Jake and Azrael care for him. 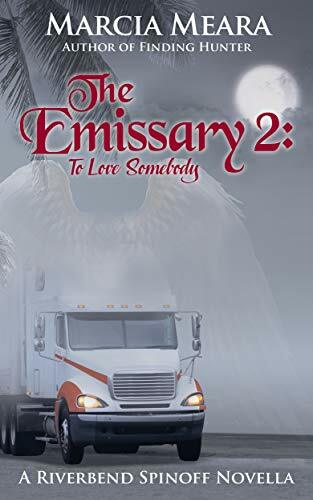 This story is mostly about relationships although the two emissaries do get to use their persuasive influence even if it’s not all plain sailing. They have to get to grips with the knowledge they can’t save everyone and free will must never be jeopardized. A well written, entertaining story with empathetic, well fleshed out characters. Her philosophy? It’s never too late to follow your dream. Just take that first step, and never look back. 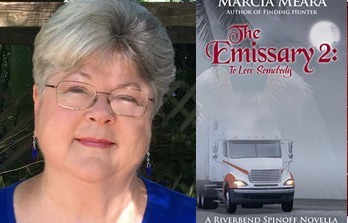 At age 74, when many people are slowing down, Marcia’s new career is just taking off. She plans to keep on writing until she falls face down on the keyboard, and would, in fact, consider that a pretty good way to go. This sounds like another good one, I shall add it to my TBR list. Thank you so much, Cathy, for such a lovely review! This one was tricky for me, I admit, being the “middle child.” I had never before considered what the middle book of a triology needed to include, with its primary function being to bridge the gap between the opening and closing acts. I think I learned a lot from the experience, and if I ever do another trilogy, I should have a better handle on that middle child. 🙂 Still, I hope there were enough adventures and moments, both funny and teary-eyed, to entertain readers and pique their curiosity for the last novella in the series. A lovely review of Marcia’s new book, Cathy. I have seen a few excellent reviews of this one. Thanks, Robbie, it’s a lovely story. It sounds great. Thanks so much.